We are manufacture and exporter of all kind of laptop. we are making with all variety in reachable prices. 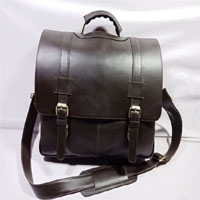 100% Leather Bag. 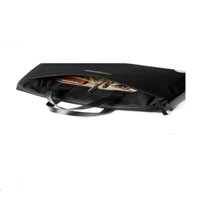 This case features top handles for you to carry your laptop in comfort, and one side big pocket for storage of small items like power adapter and notepads. ADJUSTABLE SHOULDER STRAP - Adjustable and removable shoulder straps and comfortable handles for convenient and stylish carrying. 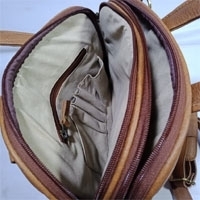 As the attachment which it is used for attach the shoulder strap, it is different from usual attachment on two sides of the bag, in order to let it look thinner and simple, the designer make the attachment on middle of the bag, you can find it on the outside pocket when you need it. Short on time? 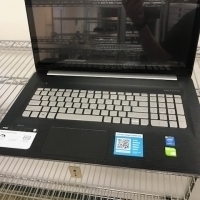 Let laptop sellers contact you. 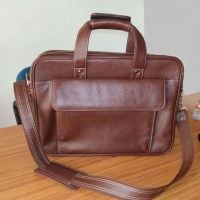 SKU Code : EBHLB-201_Brown Short Title for Product : 100% Pure Genuine Leather Stylish 15 inch Briefcase Laptop Shoulder Messenger Business Bag for Men, Dark Brown Product Condition : New Pattern : Plain Material : Leather 1 : 100% Pure Genuine Ndm Two Tone Leather : Crafted with top grained 100% genuine leather, tough stitching, Hand Made by professional artisans, beautifully crafted laptop bag that gets better with age. NDM stands for Natural Dry Milled Leather. 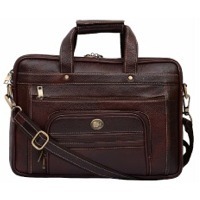 2 : Color : Brown : PRODUCT DIMENSIONS (L x W x H): 15." x 3.5" x 10", Fits up to 14.5 inch laptop. 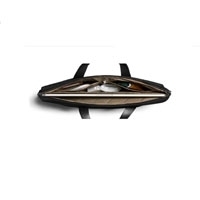 3 : MULTI-Functional Compartments : The 15 inch laptop bag features multi-functional compartments for carrying laptop, documents, mobile phone, tablet, passport, car keys or stationary items like notebook and pen; 3 zipper pockets on front side,1 zipper pocket on back side of the bag, 1 zipper pocket inside the bag for extra security;high quality metal fitting and reinforcement material used. 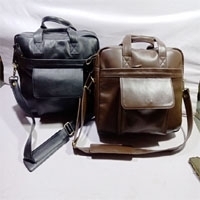 4 : Convenient And Easy To Carry Bag: Laptop bag comes with an adjustable shoulder strap for carrying the bag in a convenient way and easy carry handle for comfortable handling. 8mm Polypropylene foam used in the laptop compartment provides extra safety from damage 5 : Warranty And Care Instructions : 3 months manufacturer and seller warranty only on manufacturing defects. Keep the article dry and ventilated. Avoid any form of contact with extreme heat, sharp objects and corrosive liquids to avoid damage. DISCLAIMER: is a registered trademark. Any unauthorized seller will certainly bear the legal consequences of Trademark / Copyright Infringement. Product color May Slightly Vary Due To Photographic Lighting Sources Or Your Monitor Settings. 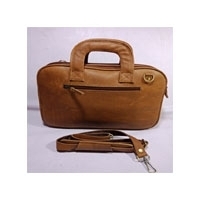 Cow dry milled, brown color Lap top bags with inner drill lining, two zipper compartments with additional pocket with flap. Excellent quality and unique touching. Best choice to show individual charm and personality. 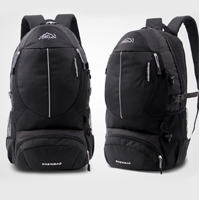 Occasions: Leisure/Street/Appointment/Outing/Workplace/Shopping/Trekking/Hiking. Adjustable shoulder strap. Details: Exterior front zipper pockets, mesh pockets in the sides of the bags, interior computer slot pocket, interior zipper pocket, cell phone pocket. can customize your own demand. Kristall’s Nano Smartphone Coating is your one stop solution if you want to protect your phone. After applying the coating, you don’t have to worry about your screen anymore. Your screen’s surface will no longer need regular cleaning as the invisible coatings will create an easy to clean effect meaning that water and debris will no longer stick on the smartphone’s surface. Dual core to i5, 4gb, 500 gb, wifi, cam bt. Screen : 10.1" TFT LCD glossy screen, 1080*600, Processor-Intel Atom N425, 1.8GHz (Price - 18 USD Higher for Dual Core CPU) Chipset : Intel 945GSE+ICH7M Memory : DDRII SO-DIMM Slot，1G/2G HDD : 2.5" 9.5mm,SATA port,160GB Resolution : 1080 X 600 OS Supports : Windows XP Graphic card : Intel Graphics Media Accelerator GMA950 Wi-Fi : 802.11b/g ,10/100Base-TX Audio : Built in Microphone , 1*audio out, support AC'97 Controler : 84 keys keyboard and 2 buttons touch pad Interfaces : 2* USB 2.0 : 1*earphone port : 1* card reader (SD/MS/MMC) : 1*DC in : 1* RJ-45 port Bluetooth : Support the built in bluetooth (Optional) Webcam : 1.3M webcam Battery : 3 Cels Polymer battery. G Waight : 1.6KG(Include battery) Accessories : Charger, User Manual, CD, Battery Power : Input: 100-240V ~ 50-60 Hz 1.7A Output: 19V 3.25A . 11 X 3 X 10. 1KG.